Complementing the growing Universal Robot range of applications standardised for packaging, Clearpack has recently introduced a Collaborative Robot (COBOT)-based Case Palletiser designed to pick and place low payload products for low-medium speed lines at places where there is a space constraint. Clearpack will showcase machines for secondary packing and end-of-line packaging at PackPlus 2018. These machines are targeted at food and beverage, home care, personal care and oil industries. The machine which will be in the limelight at Clearpack stand is the collaborative robots (COBOT) monoblock case packer. Use of collaborative robots has made automation accessible and affordable for many organizations that were out of reach of traditional robotics. COBOT monoblock case packer is recommended for operations where precision and reliability are of paramount importance. A fence system or cage is not required, and human operators can safely work side-by-side with the robot. It is compact, user-friendly and is easy to integrate with the existing line. COBOT monoblock case packer enables a collaborative operation of human and machine for case packing of bottles, cartons, jars, cans, tubes, soaps and bundled packs. Clearpack at Propak Asia 2016: Day 1. Walking through the main door of the Bangkok International Trade and Exhibition Center, the Clearpack logo can be seen prominently atop our stand. Today was the first day of Propak Asia 2016, and it was a busy day with a strong showing for the exhibition. We had representatives and machines from many of our suppliers, and many potential customers stopped by to learn more about the machine and consider packaging solutions. Yet again Clearpack Company has been proud to participate as a regular exhibitor in Propak Asia. In its 23rd year, Propak is a very important exhibition for the international processing, filling and packaging industries. This year enjoyed continued expansion where visitors from all over the world converged on BITEC (Bangkok International Trade and Exhibition Centre) to learn of new innovations and technology. Clearpack has a new partner in stickpacks and sachets. Clearpack Company is pleased to introduce its new partner, Inever S.L from Spain. Inever S.L is one of the world’s leading manufacturers of stickpack and multi-lane sachet machines. Founded in 1995, this innovative company has manufactured and delivered over 300 machines across the globe. Clearpack is exhibiting at Packtech 2014, showcasing brands like Apsol, Involvo, Torq and Netfill. The first day of the show was a warm beginning to the exhibition, with many visitors making it a point to spend time at understanding our offerings and getting a feel of our solutions. Clearpack is showcasing its entire range of products for Primary Packaging, Secondary Packaging, Case Packing & Shrink Wrapping, Palletizing and Complete turnkey solutions. We look forward to hosting many more visitors over the course of the next two days. "A new facility of "Vinasoy" – a leading manufacturer of Soy Milk in Vietnam was inaugurated recently. The upstream equipment in the project is from Tetrapack & Clearpack has done the end of line automation for the new factory. Clearpack has installed 3 robotic case palletizers." The End of Line packaging machinery scenario in Australia is now set to change as two European Packaging Technology leaders – Involvo Wrapping Solutions AG and Apsol S.r.l are ready to storm the market in association with Colorpak. Barring high speed production lines, most lines in Asia are not fully automated today. Most investments go into capacity expansion or automation contributes towards primary packing. 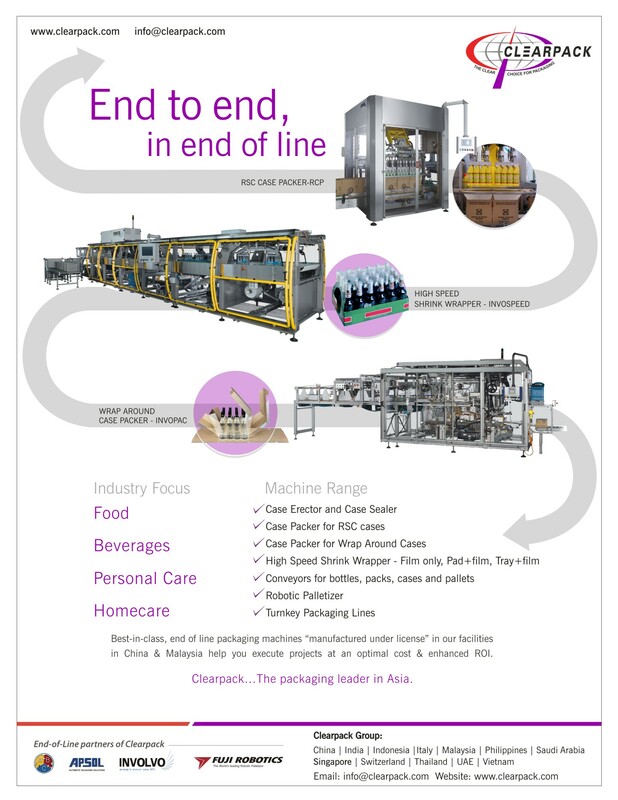 End of line automation with exception of case sealing is usually left for later or ignored completely. Horizontal Form Fill Seal Machine: Changing Technology, Leading Technology! Flexible packaging has changed in great manner in the past few years, to the point that today, the pack presentation cannot any longer be a simple pack but a real packaging solution with real shape and function benefits which will set the difference between a well presented and innovative product and the rest. The importance of line control, modulation and integration on conveyors in beverage and bottling plants could not be more significant today. Propak Asia, Thailand has always been a very important exhibition for Clearpack. It attracts a good deal of visitors from South East Asia.